Figure 1-1 A blacksmith 's fire, used primarily for forging iron . A flame is an exothermic, self-sustaining, oxidizing chemical reaction producing energy and glowing gas, of which a very small portion is plasma . It consists of reacting gases emitting visible and infrared light, the frequency spectrum of which is dependent on the chemical composition of the burning elements and intermediate reaction products. In many cases such as burning organic matter like wood or incomplete combustion of gas, incandescent solid particles, soot produces the familiar red-orange 'fire' color light. This light has a continuous spectrum. Complete combustion of gas has a dim blue color due to the emission of single wavelength radiations from various electron transitions in the excited molecules formed in the flame. Usually oxygen is involved, but hydrogen burning in chlorine produces a flame as well, producing the toxic acid hydrogen chloride (HCl). Other possible combinations producing flames, amongst many more are fluorine and hydrogen , or hydrazine and nitrogen tetroxide . Recent discoveries by the National Aeronautics and Space Administration (NASA) of the United States also have found that gravity plays a role. Modifying the gravity causes different flame types. The glow of a flame is somewhat complex. Black-body radiation is emitted from soot, gas, and fuel particles, though the soot particles are too small to behave like perfect blackbodies. There is also photon emission by de-excited atoms and molecules in the gases. Much of the radiation is emitted in the visible and infrared bands. The color depends on temperature for the black-body radiation, and chemical makeup for the emission spectra . The dominant color in a flame changes with temperature. The photo of the forest fire is an excellent example of this variation. Near the ground, where most burning is occurring, it is white, the hottest color possible for organic material in general, or yellow. Above the yellow region, the color changes to orange, which is somewhat cooler, then red, which is cooler still. Above the red region, combustion no longer occurs, and the uncombusted carbon particles are visible as black smoke. The common distribution of a flame under normal gravity conditions depends on convection , as soot tends to rise to the top of a general flame, such as in a candle in normal gravity conditions, making it yellow. In microgravity or zero gravity , such as an environment in outer space , convection no longer occurs, and the flame becomes spherical, with a tendency to become more blue and more efficient. There are several possible explanations for this difference, of which the most likely one given is that the cause is the hypothesis that the temperature is evenly distributed enough that soot is not formed and complete combustion occurs. Experiments by NASA in microgravity reveal that diffusion flames in microgravity allow more soot to be completely oxidized after they are produced than diffusion flames on Earth, because of a series of mechanisms that behaved differently in microgravity when compared to normal gravity conditions. Premixed flames in microgravity burn at a much slower rate and more efficiently than even a candle on Earth, and last much longer. These discoveries have potential applications in applied science and industry , especially concerning fuel efficiency . 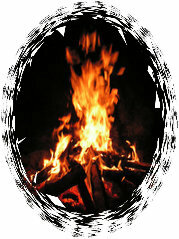 Fire ecology is the study of the interaction of living things with fire.